SALES START MAY 29th! A new Esat Vancouver real estate development is taking form at the presale 2300 Kingsway Vancouver condominium project. This brand new condo community is located at the crossroads of Kingsway and Nanaimo and brings you the same incredible East Vancouver real estate value, proven quality construction, and the type of fabulous and eclectic neighbourhood you’ve come to expect from the same developer as Electric Avenue, The Hudson, Yaletown Park and One Wall Centre in downtown. Ultimately, the 2300 Kingsway Vancouver condos for sale will feature a master planned East Vancouver condominium community of over four hundred homes! Phase One of 2300 Kingsway Vancouver real est development is scheduled for launch this spring 2010 and will offer 188 new East Vancouver condos priced affordably from under $300,000 (three hundred thousand dollar range). For more information about the new 2300 Kingsway Vancouver condos for sale, and to priority register for VIP Previews and the grand opening launch of pre-sales, please visit www.2300kingsway.com or call 604.435.2300 to register your interest in this new East Vancouver real estate development. Managed by the Wall Group of Companies, 2300 Kingsway Vancouver condo project is now accepting priority registrations and is marketed by Rennie Marketing Systems. This view at this price is unattainable anywhere else! Thing views this good are priceless? Not Here, at the new East Vancouver 2300 Kingsway condos with one hundred and eighty eight homes priced under $300’s and coming Spring 2010. 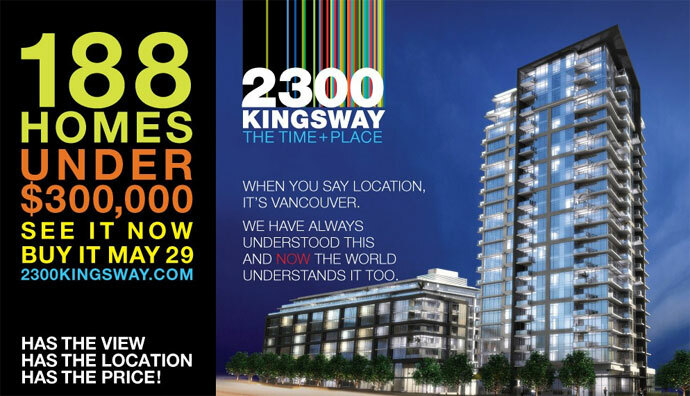 Just released: The 2300 Kingsway Vancouver condos will start sales on May 29th! Yes, you can purchase these new East Vancouver apartments May 29th, so get on the list to become a VIP registrant for the best selection of suites and best pricing. The time and place to purchase a new East Vancouver condo is right now, here at 2300 Kingsway by The Wall Group of Companies. With Phase 1 nearing sell-out, Phase 2 of the East Vancouver 2300 Kingsway condo project will be launching The Eldorado July 17th! Here are the top 8 reasons why you should buy at 2300 Kingsway today! All one bedrooms are priced under $299,000 making them the most affordable East Van apartments in town. This fabulous Vancouver location is in a prime and central location close to everything. With incredible value based pricing that starts from just $225,000, new Vancouver home ownership is now affordable. The Eldorado condo building will be LEED Silver certified upon completion, making it a sustainable development, the first of its kind in this neighbourhood. With quality construction that will last a lifetime, the Wall Group of Companies introduces a well built and designed building for you. The Eldorado East Vancouver 2300 Kingsway condos will also have spectacular views from all exposures. Inside, the suites at the East Vancouver Eldorado condo building will have stainless steel appliances including a gas range as standard finishes. Also, the last top reason to purchase a new home at The Eldorado is the record low interest rates. One bedroom suites start from just $225,000 while two bedroom plus den homes start from $349,000. In addition, the 2300 Kingsway Vancouver townhomes start from $529,000. The presentation centre is located at 2330 Kingsway at Nanaimo. THE SAME GREAT VIEWS, THE SAME GREAT LOCATION, AND THE SAME GREAT PRICE! Thank you for your interest in 2300 Kingsway East Vancouver condos for sale. This May we launched Phase 1 at 2300 Kingsway and are pleased to report that in just 30 days 317 homes were sold out completely! We are excited to offer you VIP access to our second offering at 2300 Kingsway East Vancouver condos. A collection of one & two bedroom homes and family sized Vancouver townhomes are now on sale. Here’s the best part: ALL ONE BEDROOMS ARE UNDER $299,000! DON’T MISS OUT! PUBLIC SALES BEGIN JULY 17th BUT YOU CAN SEE AND BUY IT TODAY! Visit the 2300 Kingsway Vancouver website for floorplans or call the sales centre now for pricing information – 604.435.2300. Hurry in for the best selection! *Pricing and availability are subject to change without notice. Nothing like 2300 Kingsway has ever been built in the East Vancouver real estate district in this most amazing Renfrew-Collingwood neighbourhood. With the addition of the pre-construction East Vancouver 2300 Kingsway condos, homebuyers now have a great chance and opportunity to purchase a new condominium home at affordable prices in this truly eclectic community. With modern style and a natural feel, homebuyers will have a choice between two great colour palettes that are designed by BYU Design, internationally recognized local company. Concrete construction and savvy design are couple with outstanding views for 2300 Kingsway East Vancouver homebuyers here. The living rooms at 2300 Kingsway condos will feature large windows in addition to earth tone colour palettets and custom dyed broadloom nylon carpets in the bedrooms. The main living areas like the kitchen, dining and living rooms will feature warm laminate wide plank hardwood flooring and there are modern satin chrome levers for the doors. The bathrooms at the pre-construction Vancouver condos at 2300 Kingsway project will have natural stone counters in limestone or polished marble finish as well as a generous mirror and counter space for the vanities. Also presented are sleek Euro style towerl bars, water efficient, one piece dual flush toilet, lots of pot lighting, modern lver shower head and bathtub and clean lined ceramic tiling surround. The master bathrooms at the pre-construction Vancouver 2300 Kingsway condos for sale will also have contemporary acrylic squared basins and lots of storage space. The beautiful kitchens are chef inspired and perfect for entertaining here at 2300 Kingsway Vancouver pre-construction condos for sale and include large islands with plenty of storage and preparation space, up to 30 sq ft of storage, halogen recessed lighting, overhang at countertop for light dining and GE stainless steel appliance set. 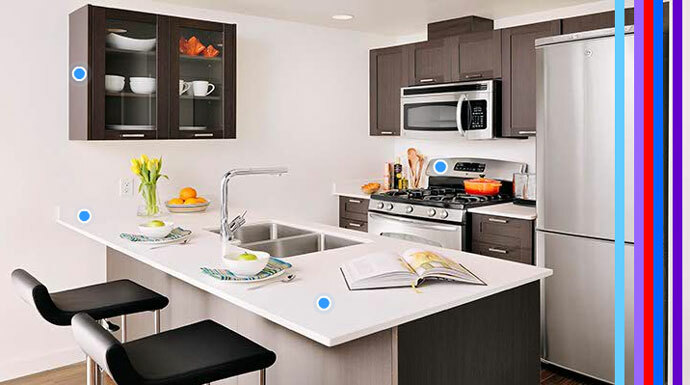 There are stylish double bowl stainless steel sinks with chrome spray faucets, elegant dark wenge shaker or contemporary soft brown flat panel cabinets in addition to composite stone slab counters with backsplashes. All homes at the 2300 Kingsway Vancouver pre-construction condos for sale are protected by the National Home Warranty. The 2300 Kingsway condo building is secured with entry fob access and has a well lit secured underground parking. Location, Price and Views – 3 Reasons Why You Should Buy at the East Vancouver 2300 Kingsway Condo Project! There are many reasons why a savvy homebuyer or investor should consider purchasing a 2300 Kingsway Vancouver East condo for sale as it approaches the grand opening launch in the spring 2010. The three main reasons why as pointed out by the New Home Buyers’ Guide include the incredible up and coming Collingwood neighbourhood in the East Vancouver real estate market, in addition to the incredible views as there are no other tall buildings surrounding you. Residents will enjoy water, mountain and city views from their living rooms and outdoor living spaces. In addition, the new Vancouver East condos at 2300 Kingsway real estate project will feature an affordable price point for any purchaser in the Vancouver real estate market to get into as this ground level opportunity is accurately priced for today’s value. One of the most important decisions in your life should be based on location, location, location. The historical significance of the location requirement for your home purchase is never more evident than in Vancouver right now. The 2300 Kingsway Vancouver condos for sale are well situated in an urban community on the rise. Conveniently situated in the Collingwood neighbourhood of East Vancouver, the Wall Group presents 2300 Kingsway condos for sale in which more than half of the Phase 1 release of new homes are priced well below $300,000, making them the most affordable East Vancouver condo project this year! However, as Rennie Marketing and The Wall Group have explained, although 2300 Kingsway Vancouver condos are affordable, but they also contain the high end features and finishes that everyone is looking for. These include downtown condominium style finishes like stainless steel appliances, granite counters and gas cooktop in addition to wood flooring and spacious floor plans. In addition, the East Vancouver condos for sale at 2300 Kingsway by Wall Group are sustainable and feature healthier homes for residents. The architecture will definitely transform the corner of Kingsway and Nanaimo and will forever push the limits in high-style urban living in the East Vancouver real estate market. The twenty two story high-rise also features an eight story low-rise and the entire East Vancouver 2300 Kingsway condo development will be LEED Silver certified. Also, for those families moving into the 2300 Kingway Vancouver condo community, there will be a childcare facility that will have LEED Gold standards and can hold up to thirty seven preschool children and toddlers. The 2300 Kingsway Vancouver childcare facility will also have a six thousand square foot outdoor play area, nature friendly landscaping, garden and recycling. The new and exciting East Vancouver real estate neighbourhood at 2300 Kingsway condos by the Wall Group are coming May 29th for advanced preview sales and will feature a collection of one and two bedroom suites. 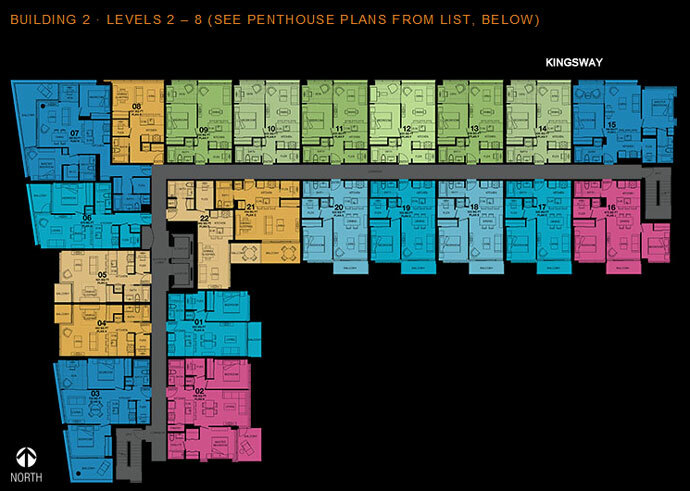 Here is a quick list of all the Builing 1 2300 Kingsway floor plans available for purchase by new Vancouver homebuyers. The 2300 Kingsway prices for this pre-construction Vancouver condo release features impressively affordable condominiums. The square footage ranges from 396 to 1089 square feet, and make perfect sense for East Vancouver real estate investors looking for cash flow properties. According to the chart below, you can see how someone else (your tenant) can pay for your mortgage here at the 2300 Kingsway Vancouver pre-construction condos for sale. Much of the mortgage payments can easily be covered by using current market rents in this situation. Therefore the East Vancouver pre-construction condos is a SMART BUY! 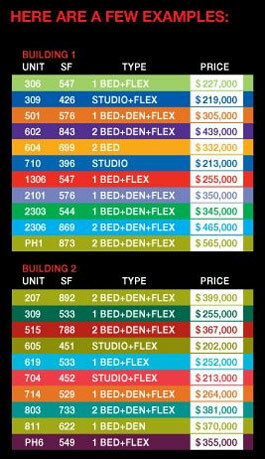 Here’s a quick list of the Building 2 floorplans at 2300 Kingsway Vancouver pre-construction condos for sale. During 2010, we saw the rise of Vancouver again through the international 2010 Winter Olympic Games. Now, we can celebrate another impressive condo landmark here at the 2300 Kingsway Vancouver condos for sale, coming very soon. With spectacular unobstructed views of the city, water and mountains in addition to high quality construction and design, the striking 2300 Kingsway Vancouver East condos for sale are featuring a fine collection of new condominium homes and townhouses for sale very soon. East Vancouver real estate is on the rise. This Signature Wall community is architecturally stunning in every way with concrete and steel construction and a glass faced. Located in the Renfrew-Collingwood East Vancouver real estate neighbourhood, 2300 Kingsway condominiums will be close to many of Vancouver’s best eclectic restaurants, the Norquay Shopping Village, schools, banks and other local services. With prices starting under three hundred thousand dollars, the East Vancouver 2300 Kingsway condominiums are well priced and located. The presentation centre is located at 2330 Kingsway Vancouver and will be open daily 12-5pm and closed on Fridays. The East Vancouver condo project features a great amenities clubhouse for residents. 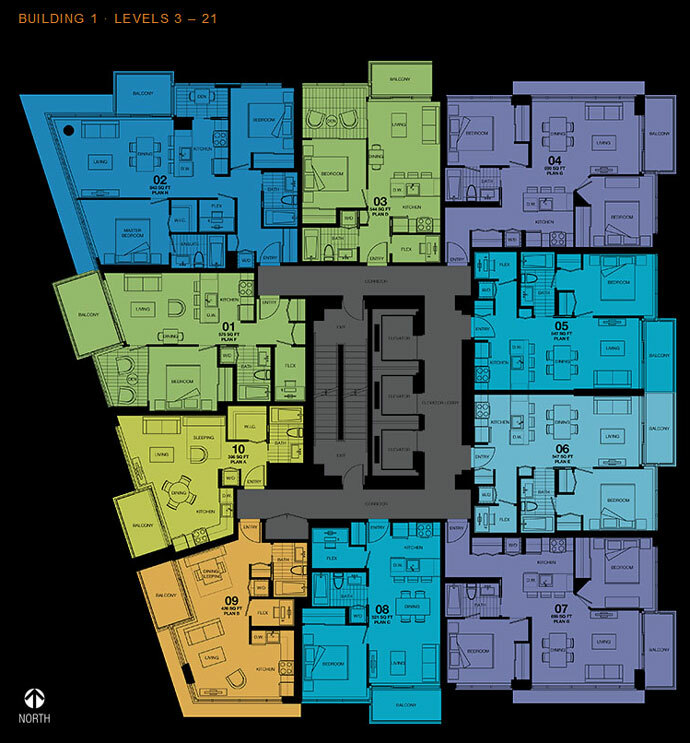 The garden level of 2300 Kingsway condominiums features a community garden/green space in addition to a large entertaiing lounge, meeting rooms (x2), bathrooms, and elevator lobby. The upper level of the clubhouse amenities features an exercise room for resistance and strength training in addition to a stretching and yoga area. The top floor has an exercise room with cardio equipment. Located just steps to shopping and to the SkyTrain and buses too. And remember, a great amenity is the 2300 Kingsway condominiums East Vancouver real estate location, where you are within walking distance to everything you need to see and do. Again, the East Van condos are brought to you by The Wall Group of Companies. Thank you for your interest in 2300 Kingsway – a new community located in the heart of East Vancouver real estate market place at Kingsway and Nanaimo Street. Brought to you by the same Greater Vancouver real estate developers of Yaletown Park, The Hudson, Capitol Residences and Wall Centre Richmond, 2300 Kingsway Vancouver condos will feature a collection of unique urban concrete presale Vancouver condominium homes with the value and quality that has become synonymous with the Wall name. COMING SPRING 2010 – 188 2300 KINGSWAY VANCOUVER HOMES UNDER $300,000! We issue you this simple challenge to prospective buyers at the 2300 Kingsway Vancouver real estate development by the Wall Group of Companies: Look at the numbers and you decide! The world has seen our stage and wants in at any price. You have the privilege of owning a piece of what the rest of the world covets. Having an inside track in the world’s most exciting city is as sure a bet as one can expect in life. But you do the math! We are sure you will see the logic. Stay tuned for more information regarding the pre-construction East Vancouver 2300 Kingsway condo project! The 2300 Kingsway Team at t. 604.435.2300, w. 2300kingsway.com, e. info@2300kingsway.com. With one hundred and eighty eight pre-construction Vancouver homes for sale under $300,000, the 2300 Kingsway Vancouver condo project represents the best real estate value in town! See it today and buy it May 29th! The time and place for this burgeoning East Vancouver neighbourhood is now here! When you say location, it’s Vancouver. We have always understood this and now the world understands it too! 2300 Kingsway Vancouver pre-construction condos has the view, the location and the price! In 2010, the world came to Vancouver to celebrate. This spring, you too can own in one of the world’s most vibrant cities. 2300 Kingsway Vancouver pre-construction condos for sale offers beautiful views, in a smart locale, at a great price. Enjoy unobstructed views of downtown Vancouver, the Coast Mountains and beyond. Quality construction and savvy design are distinct features of the 2300 Kingsway Vancouver pre-construction condo project. Just ten minutes from downtown and five minutes to Commercial Drive shopping/dining, a farmers market and fabulous restaurants, it just doesn’t get any better than this. It doesn’t have to be expensive to own a Vancouver real estate landmark. Feel the real value at the 2300 Kingsway Vancouver condos for sale. 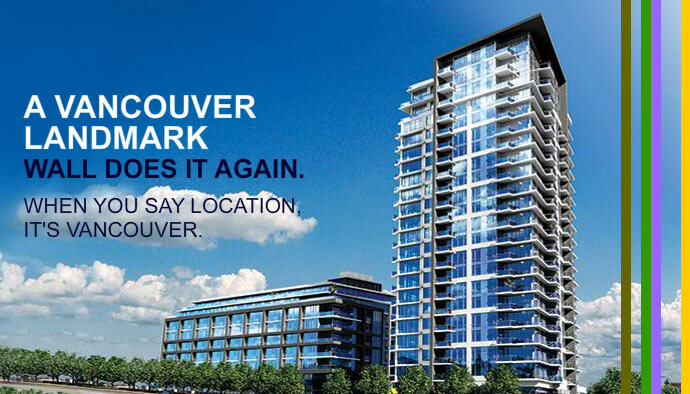 Now previewing at 2330 Kingsway at Nanaimo, the new Vancouver condos at 2300 Kingsway will go on sale May 29th, 2010. 188 Homes are priced under $300,000! Coming Spring 2010! From the developers who brought you Yaletown Park, Capitol Residences, Hudson and of course, Wall Centre. Now introducing 2300 Kingsway Vancouver condo development. Live atop Kingsway’s highest point with unobstructed views of Downtown, the North Shore Mountains and beyond. Feel the Vancouver real estate value. Get on the list.